Mounting Brackets, Exhaust Port Gaskets, Hardware is still available. !!! 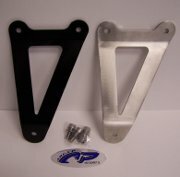 Solo Exhaust Mounting Brackets on sale - $25.00 !!! 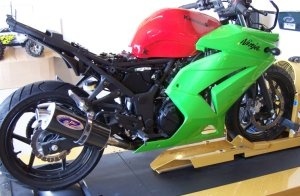 R&D bike shown affectionately dubbed "Skittles"
Fits 2008 - 2012 models - Carb and FI models. Features multi-stepped 304 series stainless steel head pipes integrated to a 2 - 1 merge collector. This is followed by additional stepped and tapered tubing changes exiting into a 12" carbon fiber muffler with 2.0" core and turn down tip. High velocity with continued expansion on smaller displacement engines is critical to increasing power. 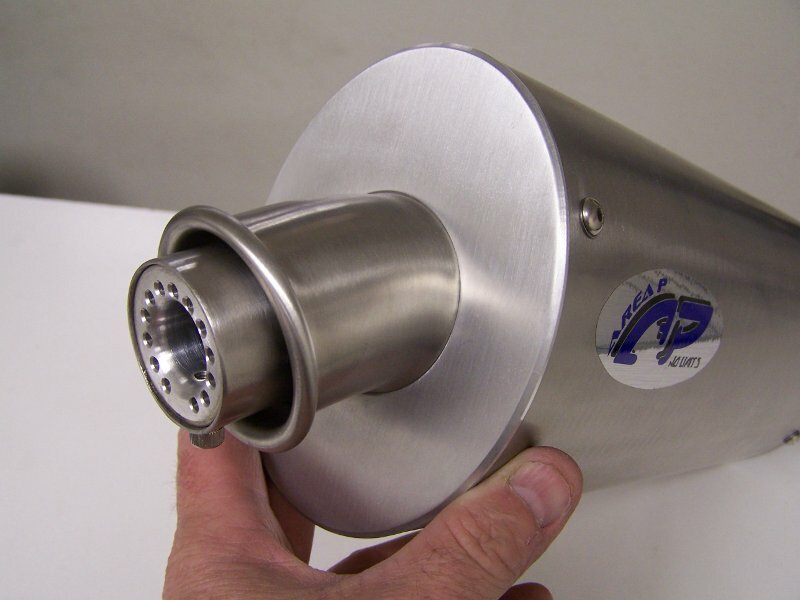 Optional Stainless steel muffler is available as well. Huge power increase over OEM and/or Slip-On muffler. The polished muffler body clamp is laser cut from 304 series stainless steel with extruded rubber insulators. A stainless steel T-Bolt clamp is utilized on the muffler inlet. 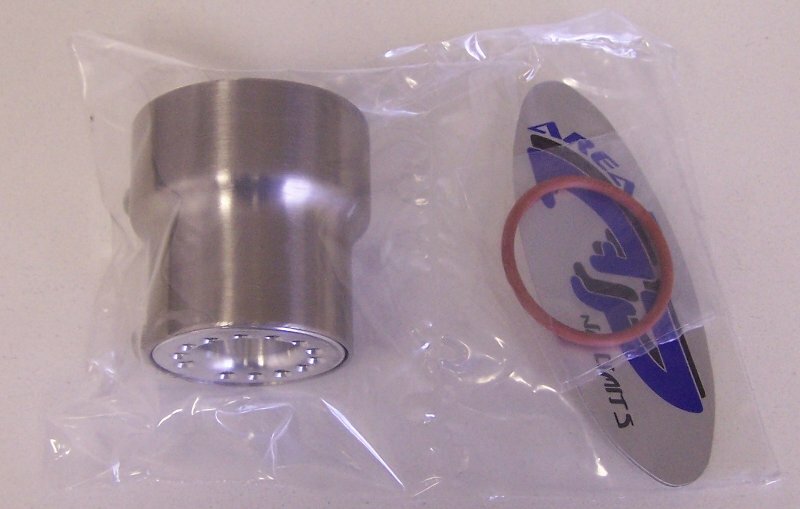 All systems now include Area P custom exhaust port gaskets at no extra charge. Area P designed gaskets feature additional "crush volume" for superior sealing. 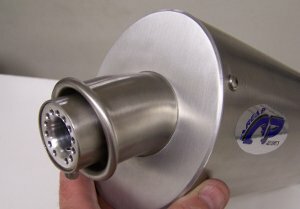 Optional Long Quiet Core Muffler - 18" muffler with 1.75" core. Available in Carbon Fiber only. Significantly quieter than the Standard muffler. Overall power is virtually identical to the standard muffler, but with a much lower sound level. Exhaust Hanger Bracket - For those looking to eliminate the huge passenger peg assembly(s); Area P offers a high quality, low cost alternative. Weighs only 9 ounces. Precisely cut by CNC Laser, then formed on our NC press brake. Two bends are incorporated starting at both the top and bottom. This gradual bending technique results in less stress on the material, superior vibration damping (similar to "tuned flex"), and no clearance issues for those with aftermarket lowering links (no swing arm contact under compression). Available in a Black Satin Powder Coat finish (*brushed satin finish is no longer available). Includes stainless steel mounting hardware. Price - $25.00 !! *NOTE - Primarily designed for the Standard Muffler. Power will be reduced. 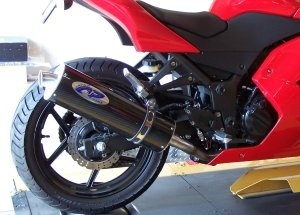 It will not be as quiet and/or perform as well as the Long Quiet Core Muffler. 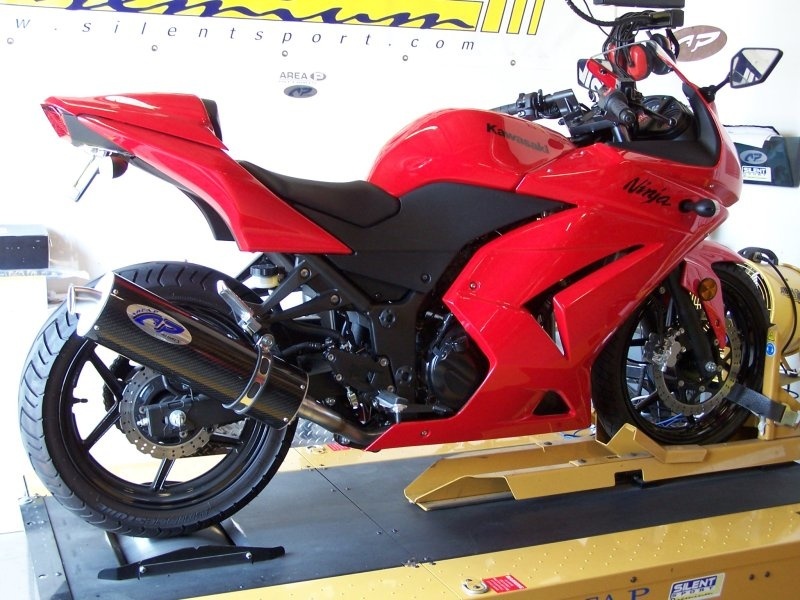 Click here to hear our 250R Ninja on a dyno run (with standard muffler). Large increase in power averaging over 18%. At peak, there is a 28% increase in power. Power increase starts immediately from 2500 rpm and carries through peak at 12500 rpm, which is over 2000 rpm higher than the OEM exhaust. Very linear on both hp and tq. The stock fuel curve was slightly wavy from lean to rich on this particular test bike, but still within acceptable specs. Chart shows results with the standard muffler. The optional quiet muffler has very similar results. 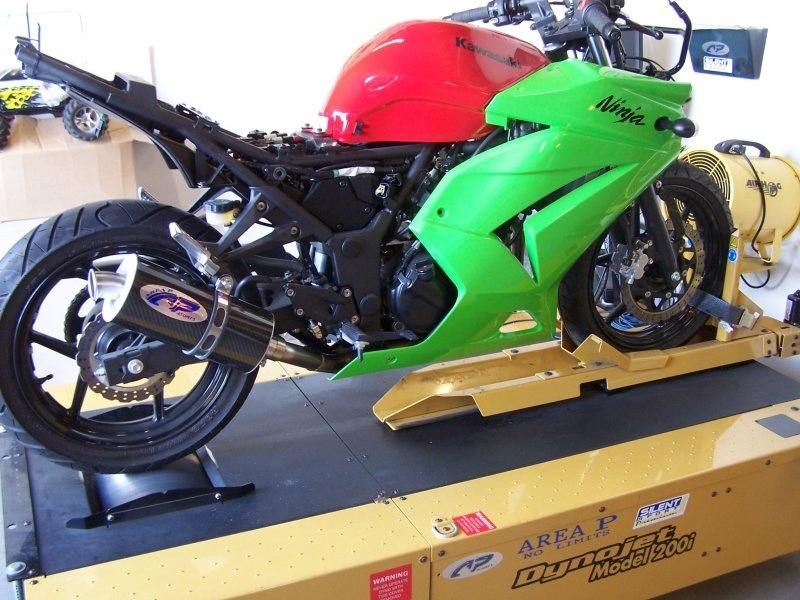 After testing several other production bikes, we recommend Dynojet kit # 2193 or *Area P Customized Dynojet kit (# 2193R), to help optimize the fuel curve and further increase power, as the production bikes do have a tendancy to run lean in the low/mid range especially. For your convenience, Area P has both Jet Kits available to order.